When I say the word “Absinthe” what do you think of? 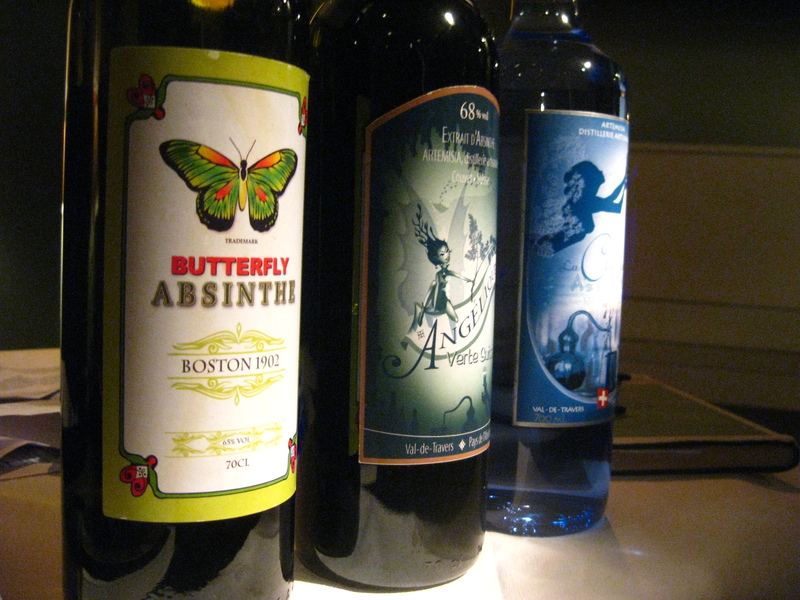 Well, so did I up until a recent absinthe tasting during which I saw no sign of her fluttery wings. Moulin Rouge had it wrong all this time! Instead, it was my taste buds, rather than my psyche, which was treated to some delicious delights. The night it all occurred was grey and drizzly – the type of typical Autumnal weather that makes us Brits begin to fantasize about log fires and cozy evenings in. And what better way to embrace this change of season than to get some super-strength liquor down my gullet? So the boy and I headed out of the rain and into the quaint downstairs bar area of Knightsbridge restaurant Brompton Bar and Grill – aka: London’s first absinthe bar. It serves up La Clandestine Absinthe and its brand ambassador – Alan Moss – was there on hand to take us through the intriguing and tasty history of the drink. Moss and La Clandestine’s distiller, Claude-Alain Bugnon, began working together in the early noughties. The product is handmade in the birthplace of Absinthe: Couvet, in Switzerland. Moss regaled us with tales of its rise to fame in the 1800s (from when the French gave it to their troops in Algeria to fight off malaria, to when wine and cognac were nearly wiped out because of a root disease, making people turn to absinthe), all the way to its decline in 1910, when it was banned under the guise that it made you mad. 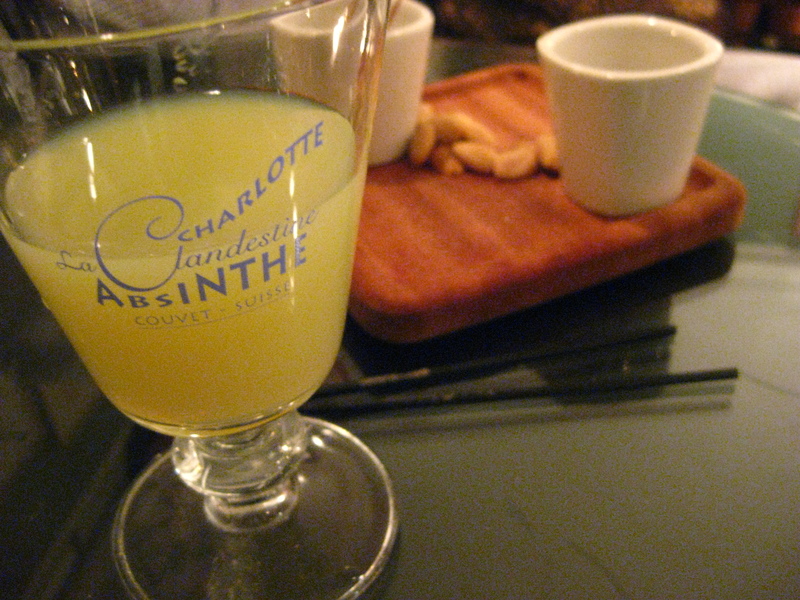 However, absinthe was never banned in the UK – as such, a Savoy cocktail book from the 1930s has more than 100 drinks containing absinthe (and only four with vodka). Over the evening’s historical tales of underground absinthe making on family farms and its resurgence into glory, the boy and I tried a multitude of cocktails containing absinthe: from Hemingway’s own invention, Death in the Afternoon, to a whisky-sour style drink called Morning Glory Fizz and the bar‘s own take on a Caipirihna, made with absinthe. My favourite, however, was just the neat absinthe, dripped slowly through iced-water fountain. I loved those bitter, aniseed flavours that always transport me straight back to Paris. The one thing that was clear, was that Moss loves what he does – well, who wouldn’t really? – and he is clear about wanting his product to remain more of a work of art, than a mass-market seller. “I may be selling it in 22 countries, but if I only sell it to a few bars in each one, that’s fine. 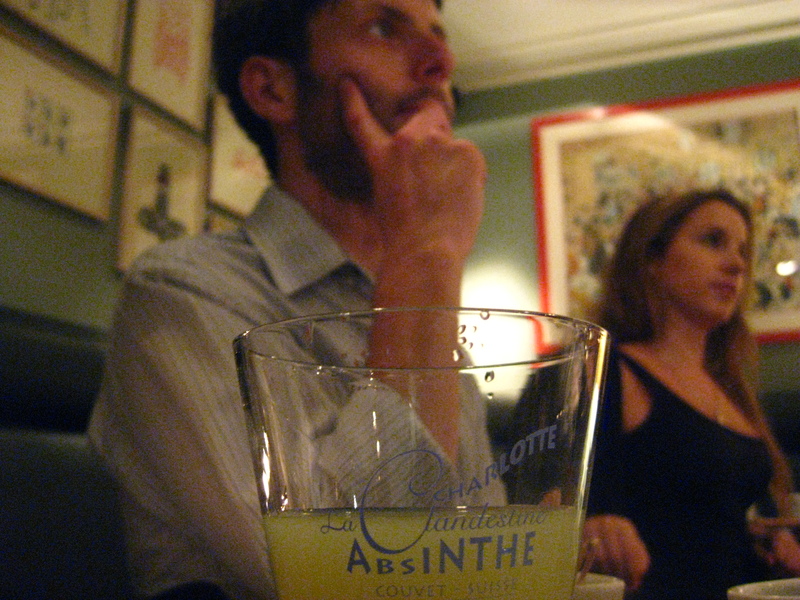 I want to serve my absinthe where people enjoy it,” he told me. Moss added he hopes it becomes more recognised as a slow-sipping, fine drink, like a good scotch or cognac. “We hope that most people respect it and we want to start with people who make it and serve it properly,” he said. That I can heartily agree to. Gwiltypleasures always says a big cheers to the little guy, trying to make great products that thrill the taste buds whether neat or in a cocktail. And that’s just what Moss is doing. La Clandestine is available at all fine specialty drinks companies, such as The Whisky Exchange, Gerry’s Wine and Spirits, and Liqueurs de France, amongst others.